A secluded driveway is the only entrance to our private casitas. Burch Street Casitas offers a unique lodging experience. 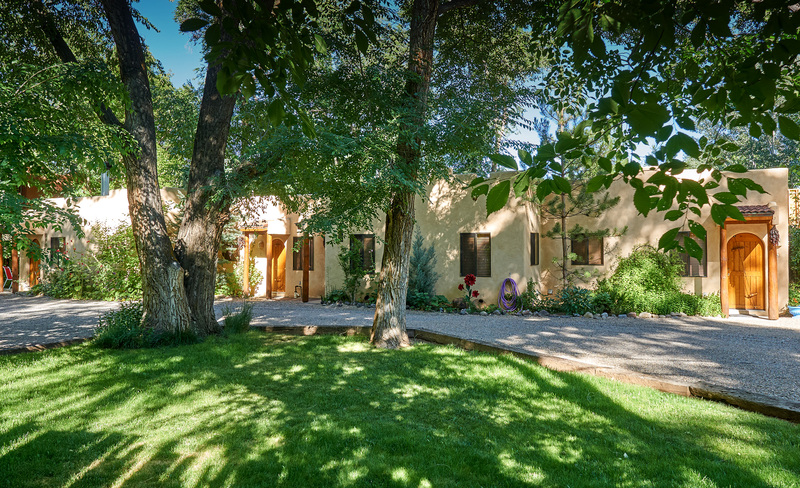 We provide quiet and private accommodations for your Taos vacation. We are located in one of Taos' oldest neighborhoods, Burch Street Casitas is an easy walk to historic downtown Taos Plaza. We have four cozy, southwest style casitas on our ¾ acre secluded property, with plenty of off-street parking. Our casitas are perfect for a quiet getaway, workshops, art classes, a ski trip or a Taos adventure. We're close to everything from art galleries and shopping to entertainment and events. Compare to a hotel mini-suite. Each casita has an open floor plan with a private entrance and patio, full bath, king size bed, complete kitchen, washer and dryer, fiber-optic wireless internet, Smart TV with Netflix, and wood burning fireplace. We're a small, 'mom and pop' lodging property. Burch Street Casitas owners, Jim and Nancy, want to be sure your stay in Taos is comfortable! Please contact us at 575‑737‑9038 for reservations. Autumn on Burch Street is Amazing! Our tastefully appointed casitas provide living area, dining area and an office desk in an open floor plan with contemporary southwestern architecture. Each cabin has a full kitchen, complete with basic cooking utensils and dinnerware. The bedroom area has a comfortable, king sized bed with Serta pillow-top mattresses. Each casita also has a full sized bath and complete laundry, including detergent, with high-speed fiber optic wireless Internet and Smart TVs with Netflix. "When you need more than just a Taos hotel room." get your 7th night FREE! Reasons to Stay With Us!